The external battery is identical to the battery inside of the Dive Mag 1. The spare battery pack doubles the operating time of the unit. 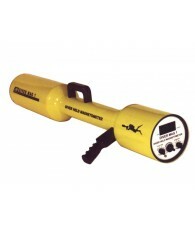 The battery charger provided with the Diver Mag 1 is used to charge the spare battery pack. A cable with an underwater connector connects the spare battery pack to the Diver Mag 1.